The lesson of MAPS banding on June 14 was that the only thing worse than water in the net lanes and over a foot of water on the path to the meadow nets – is a hole in your boot. Water. Everywhere. 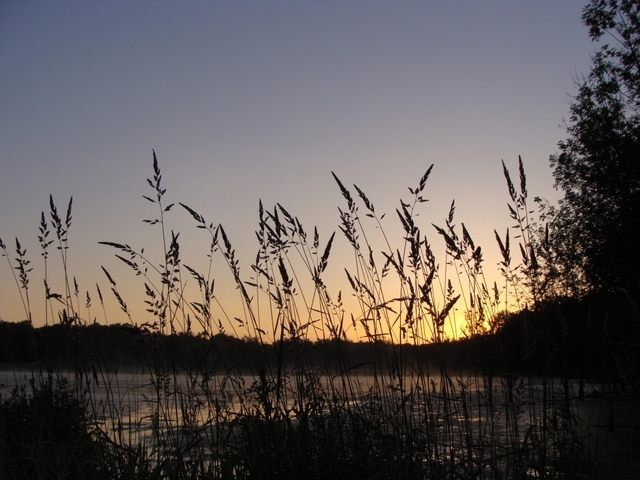 Places that in ten years never had standing water in June were wet – and muddy. Due to the high amount of clay in soils, the mud was also slippery making walking a slow go. But regardless, 17 new birds were banded, and 2 birds were re-captured. 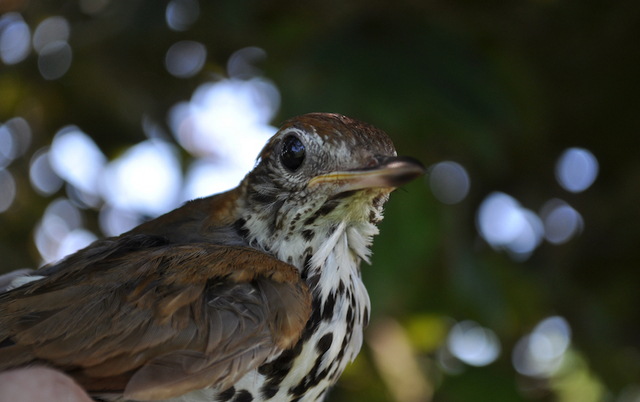 The first Wood Thrush of the season was banded – a male that had been singing in the woods for 2-3 weeks. The parade of American Robins and Red-winged Blackbirds continued, including a male American Robin who had a wing chord of 137mm. 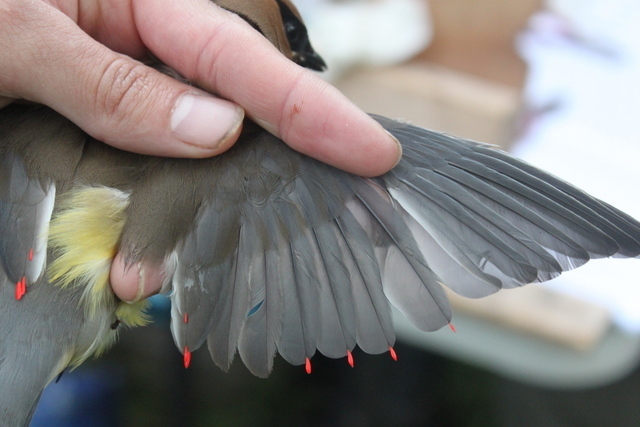 Cedar Waxwings are now in the area in force and several of them were banded – with the difference in numbers of waxy tips allowing for a good comparison between younger and older birds. Thursday June 27, 2013: Today, Emily and I headed down to Baker Park in Canandaigua to participate in their “Animal Exploration” summer day camp. The day camp supports Bridges for Brain Injury, a local organization that raises awareness of and provides services to people affected by brain injuries. Today, thirty children between the ages of 6 and 12 were at the camp, and they were treated to a walk through the woods to see the nets, close-up views of birds in the hand, and the always-popular kid-friendly “beanie baby net.” The kids were fantastic, and asked many excellent questions such as “why do people band birds?” and “do the bands ever get too small for the birds?” and “Do birds remember where their nests are?”. Emily bands a Cardinal as eager campers look on. Henry, Becky, Rodney and I waited for a bit. While we were waiting we set up the Screened Canopy. After that I set up the banding station while Mr. Olsen and Henry set up the nets. Claire came after six clock to help us once again! So far Claire, Henry, and Mr. Olsen have not missed a day of MAPS. They’ll most likely get perfect attendance this season. Becky brought her famous Chocolate Chip Cookies that everyone likes. Bird of the day was Black-capped Chickadee with 7 banded. We got our first Hatching Year birds which were: American Robin, Black-capped Chickadee, Downy Woodpecker, and Common Grackle. It was another slow MAPS session with 25 birds and 17 retraps. New for 2013 season are: Brown Thrasher, Black-capped Chickadee, Downy Woodpecker, and Common Grackle. Becky’s friend from Texas came again brought Donuts again and brownies this time. It was a good day to have the screened canopy with some spotted showers in the morning and it kept us dry and mosquito free. We think the reason it is slow at MAPS has something to due with the rain and the wind. With Warren out, Ryan was able to catch up some on being the top bander. Missing in action Warren, Brendan, Lisa and Ethan. June 21, 2013: 16 newly banded birds, 18 recaps. Our numbers have fallen since opening two weeks ago. I’m hopeful they will revive, however. All in all a rather slow and dull day. A misty morning started us off, and many of us took advantage for photos. The dew settled on a lot of our nets from the night previous, and some minor adjustments slowed net opening. We captured the usual High Acres suspects; Gray Catbirds, Song Sparrows, and Yellow Warblers for the most part. Of note, we captured a pair of Brown-headed Cowbirds in the net beside one another. 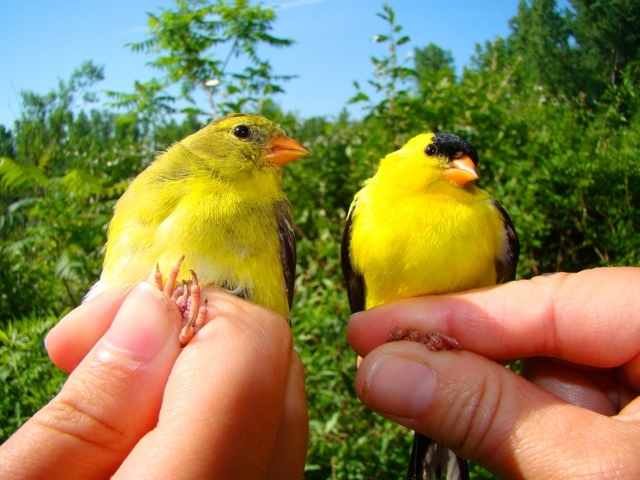 They were banded simultaneously, photographed simultaneously, and then released simultaneously. 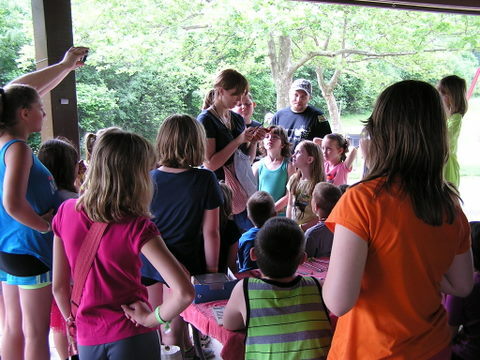 Our next banding session is July 5th and we hope that this longer hiatus from banding in the nature area will allow the numbers to rebound. 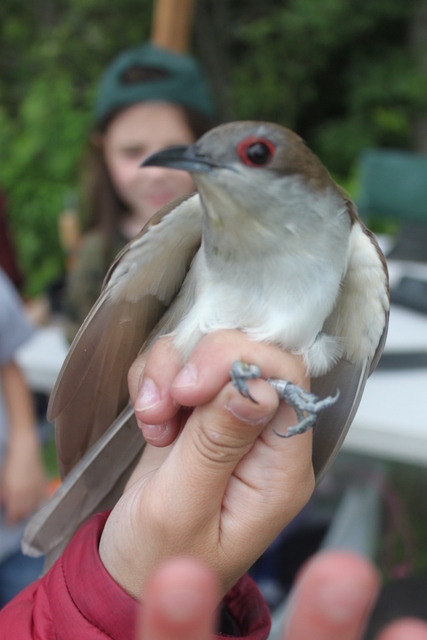 DEAD CREEK BIRD OBSERVATORY MAPS FIFTH PERIOD: Black-billed Cuckoo! brookser	Summer Banding	Comments Off on DEAD CREEK BIRD OBSERVATORY MAPS FIFTH PERIOD: Black-billed Cuckoo! We started the 2013 MAPS season small. Henry. Rodney and I set up nets at 4:45am and we made the first net check about 5:30. It was a windy start but not really blowing and cool. We had 22 new and 15 retraps; 12 species. 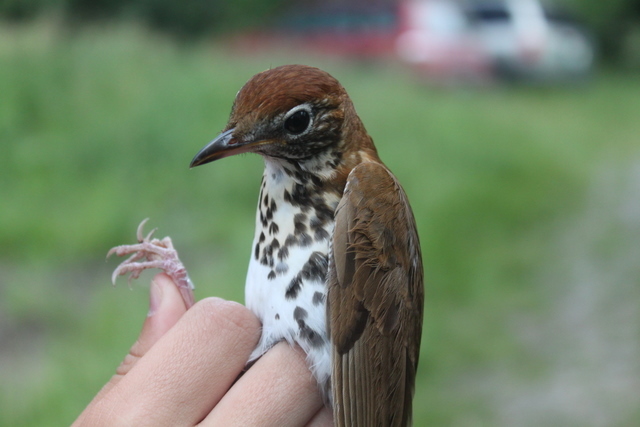 New for this year’s MAPS season is: Black-billed Cuckoo, Hairy Woodpecker, Wood Thrush, and Ovenbird. Overall it was slow until 10:00am. We had 11 birds on that net run. It was our busiest run of the day! And our only busy run. The kids loved helping release the birds for us. Bird of the day was Gray Catbird with five banded. Warren came right about then to help out. About an hour later Claire showed up. Ryan got added on the board for top bander for 2013. But he is behind Claire, Warren, and Mr. Olsen. Becky’s friends from Texas came and brought donuts plus apple crumb muffins. Some college students came and Rodney’s co–worker Betsy Stine and her three granddaughters came and joined us again. Becky Trombley’s chocolate chip cookies and her muffins were missed, as well as Becky herself. Brendan Collins, Lisa and Ethan Sausville were also missing. At the end of the day Henry pulled a Black-billed Cuckoo from net number 9 near the bottom. When Claire pulled the bird out of the bag, everyone was surprised to see it. It was a MAPS first at Dead Creek! Henry said that is the best bird of the season. But who will get the award – Henry or Claire? Claire for banding it or Henry for taking it out of the net? Other highlights were a Wood Thrush which was originally banded July 22, 2011 and our third Hairy Woodpecker at Dead Creek. 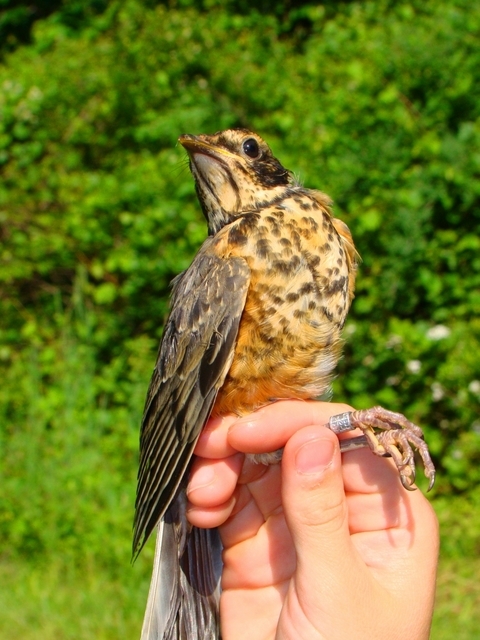 Our next banding is scheduled for Sunday June 23, 2013 and the rain date is June 29, 2013. We woke up bright and early for our first MAPS session of the year. 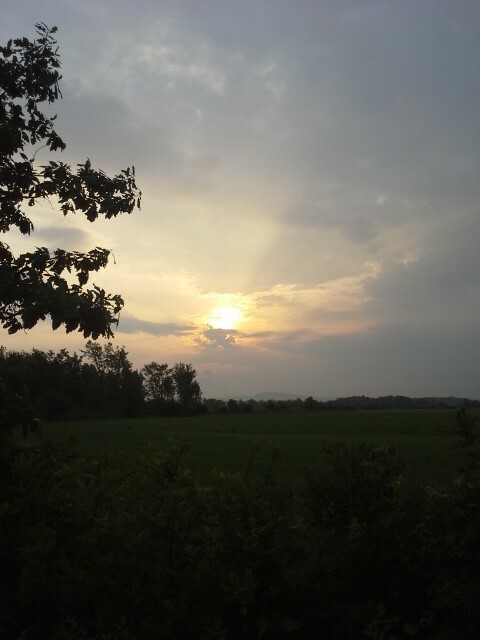 It was a beautiful morning but with a chance of rain. The crew consisted of all three Trombleys, Rodney, and Warren. It was a pretty average day consisting of catbirds, Song Sparrows, and Yellow Warblers, with nothing out of the ordinary, but still exciting since it was our first day. After all, we can’t be “speciest”! This year we have decided to supplement our data with more information about molt limits. It was a challenge at first but we are finally getting the hang of it. Studying wing molt in a Cedar Waxwing. HANA June 15: 29 adult birds of 12 species banded, 3 hatch-years, 19 recaps. 48 species observed in the study area, a couple of nests observed as well. 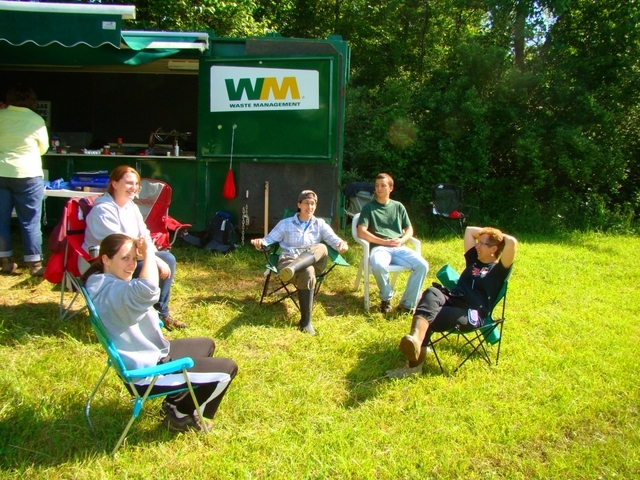 Ten volunteers came out to enjoy the day, including several RIT alumni and BBBO veterans. Many able ears and hands were available for helping. Some highlights included the babies, a hatch year Northern Cardinal and a hatch year American Robin. 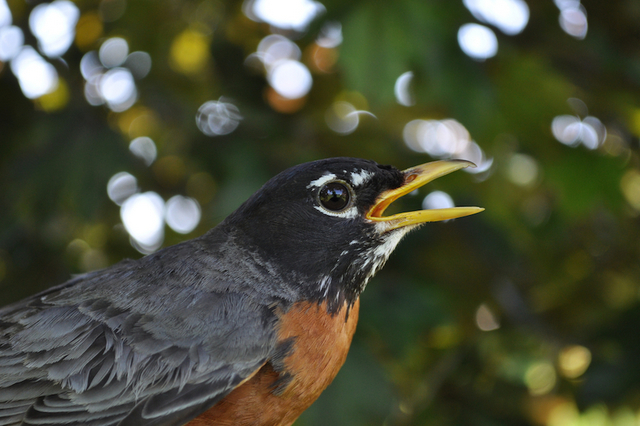 At this age the robins look more like thrushes than ever, with some speckling on the breast. We also had a couple of gorgeous grackles, and a pair of American Goldfinch. One interesting capture was a decidedly second year Warbling Vireo that was already banded. However, it was not banded at HANA! We caught someone else’s vireo! Very cool. 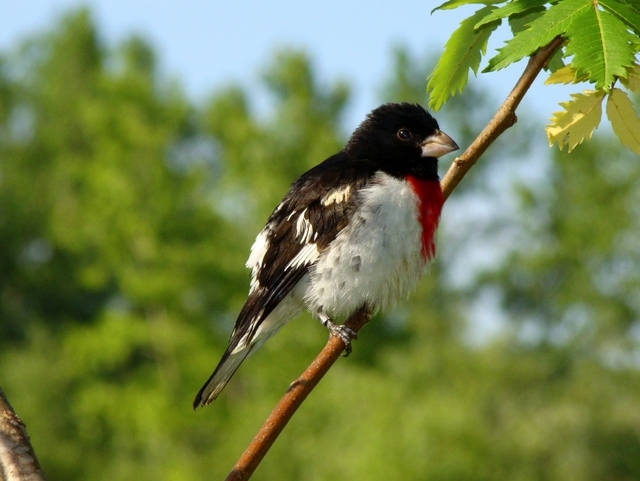 Also cool was a male Rose-breasted Grosbeak, who perched just long enough for us to get a photo showing his band. Finally, my favorite bird of the day and my favorite bird of all, we captured an after-third year male yellow-shafted flicker! Looking at the primary coverts it was a textbook aging call as an after third year, truly a perfect specimen. All in all it was a great day with many interesting captures.